Taekwondo Program of FISU Forum 2014 in Gwangju — Participants in the taekwondo program of the 12th FISU Forum Gwangju 2014 pose at Honam University in Gwnagju, Korea on March 19, 2014. Under the topic “Taekwondo as a Sport for All: Taste of Taekwondo,” the one-day program drew a total of 42 people from 21 countries. 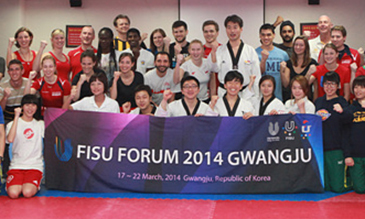 The taekwondo program of the FISU Forum 2014 has wrapped up in a resounding success in Gwangju, Korea on March 19, 2014, drawing a total of 250 persons. The one-day taekwondo program featured two sessions. The first session took place at the Kimdaejung Convention Center in Gwangju, in which Prof. Russell Ahn of the University of California Berkeley made a WTF presentation on its engagement with FISU and its educational programs and a report on the UC martial arts program. Under the topic “Taekwondo as a Sport for All: Taste of Taekwondo,” the second session of the taekwondo program took place at Honam University in Gwangju on March 19, 2014, drawing a total of 42 people from 21 countries. The one-day program, organized by the 2015 Gwangju Universiade Organizing Committee and supported by the World Taekwondo Federation, is part of the 12th FISU Forum Gwangju 2014, which kicked off on March 17 and concluded on March 22. The six-day FISU Forum 2014, which featured academic sessions, sports and cultural activities, and forum fair, attracted a total of 227 people from 64 countries. Under the auspices of the International University Sports Federation (FISU), the biennial FISU Forum started in 1992. “Most of the participants in the one-day taekwondo program gave a very affirmative response to the overall program,” said Prof. Jung-heon Kim of Yongin University, who facilitated the program.